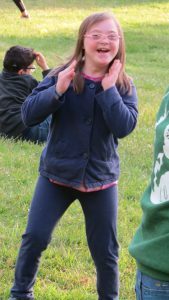 Special Family Camp is designed for kids and adults with special needs and their entire families to enjoy a camp experience in an inclusive, supportive environment. 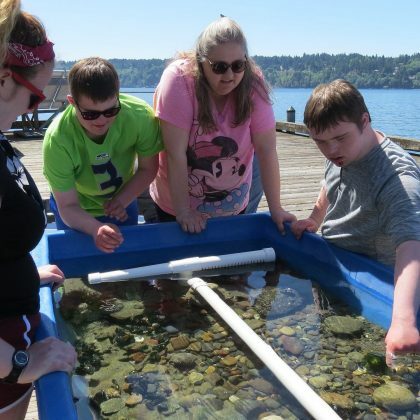 Spend Memorial Day Weekend in a beautiful outdoor setting, and enjoy camp activities like archery, boating, fishing, arts & crafts, hiking, marine touch tanks, adaptive bikes, pony rides, and more. 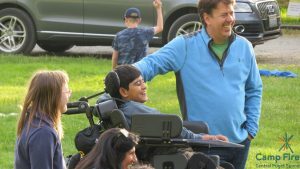 Special Family Camp is geared toward kids and adults with mild to severe disabilities, but all family members are welcome and encouraged to attend, including siblings and extended family. This event is designed to be as action-packed or as relaxing as you want it to be. The schedule is flexible, allowing you to sign up only for the activities you want to do. Activity options will include archery, fishing, boating, arts & crafts, pony rides and hikes. 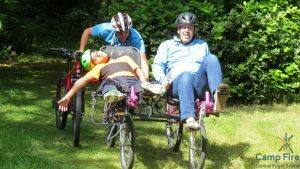 Try riding an adaptive bicycle provided by OutdoorsForAll (there’s a bike for everyone – seriously!). In the evenings, gather around the campfire for songs, skits, and s’mores, and our very popular movie night. Families stay in camp-style cabins with basic utilities. Each family is housed in their own room, adjacent to other families. A limited number of accessible cabins are available. Bathrooms are located nearby in separate buildings. Most cabins are heated. All meals are provided during the weekend, and snacks, coffee and tea are also available. Nearly all special diets can be accommodated. 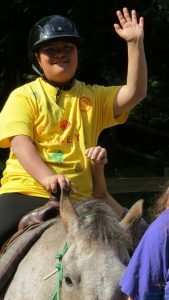 We offer tiered pricing for Special Family Camp. Select the pricing option that works best for your family. Tier 1 reflects the full cost of operating this program; Tier 2 is partially subsidized by donations. There is no difference in the program based on which tier you choose. In addition, DDA/DSHS funds may be used to pay for Special Family Camp, and some financial aid is also available. You may choose to attend the full weekend (Saturday/Sunday night), or just one night. Children under age 2 are free. Contact Carrie Kishline with questions about this event at carriek@campfireseattle.org.